Yesterday, NASA, the daily newscast, told us that they have found a black hole king size bed. 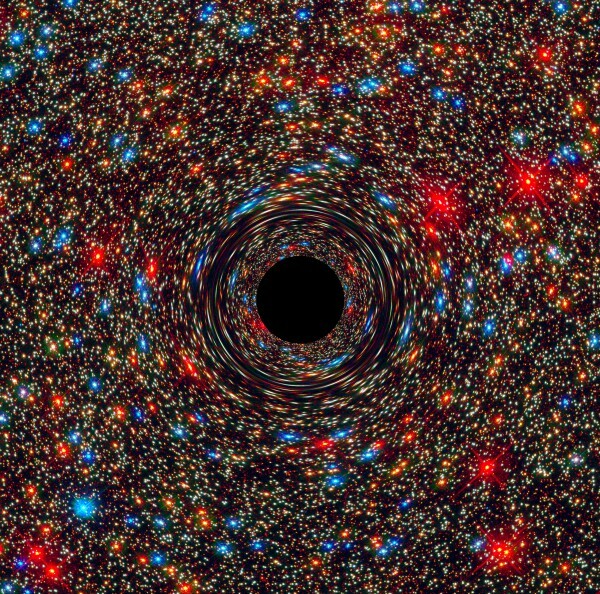 There were black holes of different sizes, like everything in this life and its size depends on many things. It depends on where appropriate, ie black holes (known for now) are the result of the collapse of a star (does not have to be great but if you have a specific size). Is, as you know the life cycle of a star is usually: condensation by gravity, starting the reaction (gravity), hydrogen combustion / helium, lack hydrogen and begins to burn helium (for lack of gravity becomes very large) , it is not hydrogen, ejected outer layers, burning helium condenses, dwarf / neutron / pulse, burning everything disappears. Well, at the time ejecting the outer layers and condensed by gravity may occur or become a dwarf, a pulsar or a neutron star or become a black hole. This depends on the size of the star in question and as you have burnt their material and that has become. It’s very simple. If when “compressed” by the severity of their burned / converted elements, this reaches a critical mass it becomes a black hole, but, as in something else. The fact is that, normally, in each center of each galaxy, which is usually is fairly or very fat star, gravity is orbiting other stars and other elements, or a black hole, gravity (which remember that as have much mass, they have very serious) is the same as fat orbiting the star. The point is they have found a black hole of a colossal size of 17 billion times our sun (the record is 21 billion times). Something that amazes but not much if not for its shape. And it is that a black hole of that size needs a lot of dough to be created, and has a huge gravity. The problem is that the detected does not match these patterns, does not orbit around the size for your having enough food, but a medium sized meal. So, using a method of calculating the size is done by observing the speed and as they turn things around (so the gravity generated is calculated and therefore the mass having, obviously) have seen that really that black hole is two. Two black holes is nothing new as there are binary black hole systems orbiting at high speeds next to each other … the lease as one of these systems help the LIGO to detect gravitational waves. But here in this detected in NGC 1600 it seems to have another more curious history. The idea (now) is that two medium-sized galaxies with black holes at their centers collided, Orbiting, in principle a black hole around each other and eating up the material around him. The fact is that one of them is more massive than the other (black hole) and finally, the smaller will be swallowed by larger so that this is currently orbiting about the fat so fast that this lengthening and, as you see in the image (which is a gravitational lens) is shaped like a donut around the first. That is, the smallest black hole that goes around the big goes so fast that has made a second layer of black hole on the first obtaining a sum at the end of the two and a hole large size of noses. The good thing about this is that it has done that, due to their size and gravitational pull that is generating some of the stars orbiting around of the black hole have picked up so much speed that are escaping its attraction and is running out food. Hence, now and for what he has around him swallowing it is called “the sleeping giant”.